Yodeling is one of the great lost arts in modern country music. As much as country elements like the steel guitar and fiddle are under siege, yodeling is something even more endangered of going extinct if for no other reason than most modern country singers are just not skilled enough to do it, especially with the confidence and control it takes to master the acrobatic vocal maneuver in a way that mimics the pining of the human heart that only the yodel can accurately convey in sound and feeling. Singer and songwriter Alice Wallace from Southern California has been one of the best yodel masters out there touring for the last few years, but it is something she primarily features at the end of her shows, almost as an interesting and memorable conclusion to her sets for people to remember her by beyond her original music. So few can do it with such similar adeptness and ease, it has become her signature. But the challenge is to work it into her music. Often skilled singers add a couple of moments where they transition to falsetto and back, but to truly yodel in a present-day country song is quite a challenge, and fairly bold since it could be heard as olden, or even polarizing. Remember, it was the premise of the movie Mars Attacks that Slim Whitman’s yodel was the undoing of the Martians. Let’s just say that not everyone has a sincere appreciation for the yodeling art form. But that’s what’s so great about the new Alice Wallace song, “Echo Canyon.” One of the biggest challenges for songwriters is to write to their vocal strengths, or even challenge themselves by pushing to the edges of their range and capabilites, and out of their comfort zone into places that sometimes the strain helps pull the emotion out of a lyric, and take a performance from marginal to memorable. 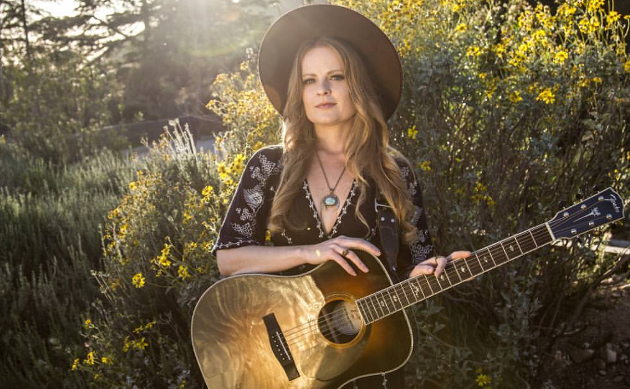 Co-written with Andrew Delaney, “Echo Canyon” creates the perfect setting and environment for Alice Wallace to showcase why she’s one of the most unheralded singers in independent country/Americana. The yodel immediately evokes the expanse of the West, and the loneliness of the desert-scape like nothing else can. The production of “Echo Canyon” is also superb, with its percussive dressing and tasty lead guitar tones. 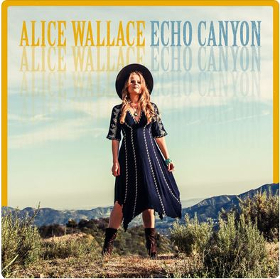 And as soaring as Alice Wallace’s vocal performance is on “Echo Canyon,” especially when she starts to hit the high notes in the 3rd chorus, it’s nothing compared to seeing Alice Wallace perform live—something folks will be able to do at AmericanaFest in Nashville come mid September. “Echo Canyon” is the first single from Wallace’s upcoming new album, and can be purchased on iTunes. She plays her official AmericanaFest showcase Wednesday, Sept 13th at 11 p.m at The 5 Spot, as well as The California Country Social at Fond Object on Thursday at 7 p.m.
Nice…Real nice. The best I’ve heard in awhile… I’d like to hear her sing “The cattle call” She really have the voice for it. And according to the book “American Roots Music” does Yodeling originate from Switzerland. And was spread in America by a Swiss group in the 1830s. Or, “I wnat to be a Cowboy’s Sweetheart”. Yes that would be great too. Or “Cowboy Yodel”, Remember Wanda Jackson singing it, was one of my favorites when I was a teenager. Funny you should mention! Do not miss a chance to see Alice Wallace live!!! I want to be a Cowboy’s Sweetheart is on Alice’s latest album. LOVE. I discovered Alice recently when she was among the group of musicians performing at a Bakersfield Sound Tribute concert at the intimate listening room Coffee Gallery Backstage venue in Altadena (north of Pasadena, CA). She was the only performer featured that night whose vocal talent just blew me away. I’m a big fan of cowboy/cowgirl music and yodeling thanks to years of attendance at the Santa Clarita Cowboy Poetry and Music Festival held each spring and Alice definitely has the vocal chops when it comes to yodeling. In a stroke of sheer dumb luck (and hot, humid weather) I put off attending the Orange County Fair in Costa Mesa until the final week (it runs for a month). To my surprise Alice and her band were performing on a music stage over by a large food court in a set that ran from 8 to 11 PM. That final week was the only time she was booked at the fair and she was performing all five final nights. She featured a good dose of yodel and classic country songs from Patsy Montana to Patsy Cline as well of a bunch of quality originals and admitted her biggest musical influence was Emmylou Harris. Even though Alice hails from Fullerton she admitted she probably plays more gigs in Texas than here in Los Angeles and Orange Counties (well except for the Coach House in San Juan Capistrano anyway). She is nowadays about the only single LA area based Country/Americana artist I am currently aware of that I make an effort to see perform live locally when I can. Alice quit her day job five years ago and went “all in” striving to become a self-supporting singer-songwriter and I’m really rooting for her to realize her dream as she surely has the talent and determination to pull it off. This is just downright lovely stuff . Alice has a GREAT voice , steeped in character , conviction and control . The lady can SING ! The lyric is beautifully crafted and the production TOTALLY sympathetic to the intent . A gem . And yeah …I suppose this is called yodeling ..but its a s much a falsetto vocal perfrormance as yodeling , I think . Don’t care what its called . I love that it doesn’t pander whatsoever …it doesn’t COME to ME like mainstream crap …it takes ME to IT !…and that’s what I want country music to do sometimes …take me there…put me in that place , that experience …. It works wonderfully in the same way things work on Marty Stuart’s latest ( Way Out West ) . I’m loving Alice Wallace’ music ….and c’mon …how great is her name ? Yep albert you called it. The name alone Alice Wallace is epic! Man…I really want her to win a big award now just so I can hear the announcer say The Grammy goes to Alice Wallace!How improbable and unlikely but wouldn’t that be great? Oh, and, yes she’s got killer pipes to spare along the lines of any country diva. And she’s a cutey…..win, win, win in my book. Thanks Trig, good good stuff. No pre order other than iTunes? Vinyl? This is just a standalone single at the moment. It may be a while before she releases the record. I think she wanted to get this out before AmericanaFest. Australian country artist Johanna Hemara released two Yodel-albums: I Yodel In My Dreams (“Only You”, “Yodelling Sweetheart”) & I Love To Yodel (“Indian Love Call”, “Lonesome Blues” & “Yodel Polka”). BY GOD YESSSSSS!!!!!!!!!!!!!!!!!!!!!!!!!!!!!!! I love it! I love it! I love to hear yodeling, great!!! I mean, this isn’t the pure yodel like Don Walser did. in my mind he’s the greatest yodeler that ever yodeled. But here the yodeling is less about “the yodeling itself” and more about the music and melody. at times it’s more “falsetto singing” instead of true yodeling. and wow!!!! this girl has an incredible vocal control! She’s got it so totally nailed down, it’s perfect. since we’re talking Slim Whitman, that dude could hold a note longer than any singer I’ve ever heard but honorable mentions go to Ronnie Milsap and Colm Wilkinson. but wow, incredible high note at the end, fantastic control. see kids? this is what real singers sound like! this is just so awesome! I haven’t heard anything like it. God Bless You Triggerman, this is an awesome find. I’m sure I’ll be praising it for a long time! I gotta add this one to the Fuzzipedia archives. I demand more!!!!!!! I’m a fan!!!! I like it. I’m buying it of course, it will be good on a long drive. When I first listened, I was worried I eating crow with liking music my country folks would too. Not yet though because I’ve always liked Hollywood soundtracks. She’s from Hollywood and her co-writer has written songs for the Backstreet Boys and he’s from Edison NJ. Won’t be able to convince anyone back home she’s not a snake oil salesperson, and that’s too bad, because her music is fun. But they won’t be convinced she’s not just another Hollywood hotshot who thinks she can get their money for fame and glory. They just don’t trust city people for good reason and they spread the word. I almost looked naive again in their eyes. Ya, ya, ya, when ya coming home? Not yet, don’t want to believe it, but I’ll visit. I’m definitely a Texan. And if I wrote songs for the Backstreet Boys, then I don’t remember it and haven’t been getting my checks. Sorry about that. Goodness, I was looking at another Andrew. But I read the bios after I wrote that, the number one song writer in the world is a association… what does that machine? Great song, kind of reminds me of something Brian Burns would do. Speaking of which, where has he been? I’m loving that Alice is slowly but surely getting the exposure she deserves. I had the chance to meet and see her play a few years back, and let me tell you that she is every bit authentic as you would hope. No snake oil here! Kudos to a great song from Alice and Andrew, and superb production that just sounds fantastic. Alice Wallace “Cowboy’s Sweetheart” ..like no other! You will Not be disappointed with a live performance from Alice.. she’s better Live.. ! You try and try and try to learn to sing. And then you hear something like this and realize some people just have a gift. Great voice, and the instrumental side of it is a perfect match for what she’s doing. Sure appreciate all the kind comments! And thanks to Kyle for the great review! We so enjoyed creating this song and it means so much to have it so well-received. I absolutely love carrying on the strong tradition of yodeling in country music – whether it is simple voice breaks like we put here in Echo Canyon, or more complex yodel phrases a la Cowboy’s Sweetheart, which we recorded on our latest album. Looking forward to releasing a new album just as soon as we can get back in the studio, and hope you’ll join my email list at http://www.alicewallacemusic.com to keep in touch!